Biography and accomplishments or why Ramses IX was famous: Tomb Robbers and Corrupt State Officials. 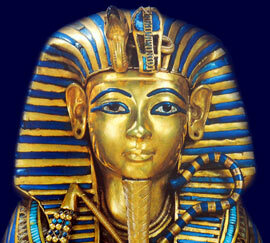 During his reign it was discovered that tombs in the Valley of the Kings had been robbed. The royal tombs had been subject to attack by Libyan raiders and in the sixteenth year of his reign the nomarch, or mayor, of Eastern Thebes called Paser compiled a report on a spate of tomb robberies. In the report he accused the nomarch, or mayor, of Western Thebes called Paweraa of either being involved in the Tomb robberies or being negligent in his duties in protecting the tombs. The charge was never proved. Each section of this Ancient Egyptian website addresses all topics and provides interesting facts and information about the Golden Age of Pharaohs and of Ramses IX. The Sitemap provides full details of all of the information and facts provided about the fascinating subject of the Ancient Egyptian Kings - their life, family, reign, dynasty, important dates and events and accomplishments.